Meet Elsie - she arrived yesterday. We're not quite sure how old Elsie is but going by the note on the outside of the case she is getting on. The note says ''Motor Blew Up in April 1933 - STUFFED!" 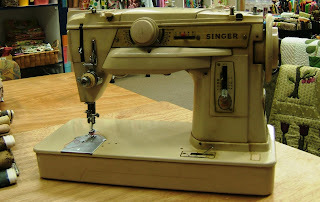 She might not be able to work anymore, no more stitches for Elsie, but I think she is lovely and have been entrusted to look after her. I'm sure I know just the right spot in the shop for her to nestle. 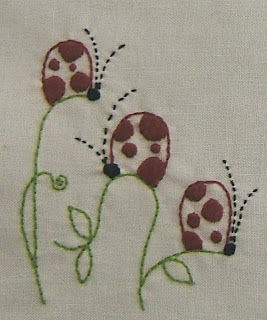 I have been working on Natalie Lymer's two new Cinderberry designs this week - have just done the little stitchings so far - cute as cute. This one is for The Little Lady Bug - lovely little needlecase and mini tote. 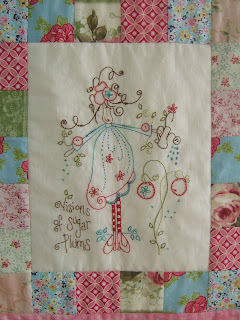 And this little one is for the Stitchers Treasure pattern. Have had fun today putting together fabrics for a new quilt - ''Life's Pleasures and Treasures'' - stunning new pattern from Kerry Gillespie of My Favorite Things. You can find a picture on her blog - myfavoritethings-kerry.blogspot.com. 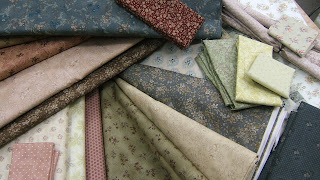 I love this quilt as it is quite different to anything else I have seen for a while and the fabrics I am choosing are really vintage almost reproduction in style - I have just received a gorgeous new range of some Quiltgate fabrics and most of these have been ''put aside'' for this quilt. And I'm pretty sure I have a few worthy inclusions tucked away in my stash at home as well! Hopefully I will be able to show you the start of it next time. I need to say "thanks" to those who have left me a comment - they are really lovely and encouraging and I do appreciate them. Not feeling quite so nervous about this anymore, and your kind wishes really did help! Thankyou! 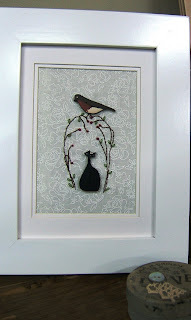 So, have a great weekend - I've got a soccer tournament to attend, and there will be a little bag of stitching in the car, just in case there are some down moments, in between the games. 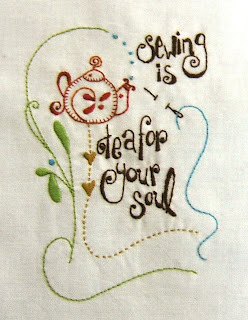 Happy weekend stitching!